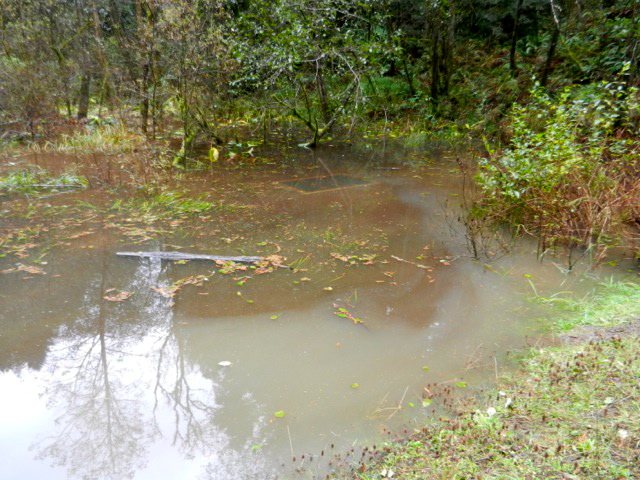 ARCATA COMMUNITY FOREST – Sometime during the first week of November, unknown suspects intentionally plugged the water inlet at the Jolly Giant Dam. Water has risen in the reservoir, though no danger to citizens or property is foreseen. The dam, built in the 1930s by the Union Water Company, once provided Arcata with a water supply. 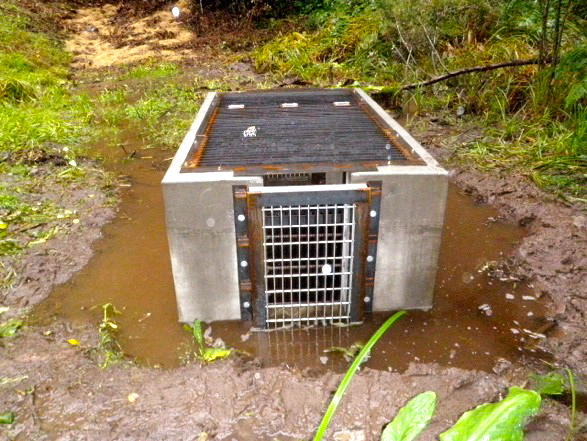 It is located about one mile east of Humboldt State University in the Arcata Community Forest near Trail No. 8. It and the former reservoir to its east haven’t been used for water detention and storage since the 1960s, and the City recently began installing improvements to make the aging structure safe and stable. One of the improvements was a new inlet installed just last year, which sends water through a pipe to the newly-reinforced spillway. 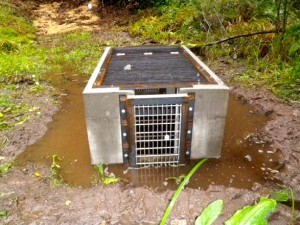 The locking inlet was part of a response to a previous, similar vandalism incident in 2004, in which camping gear – tents, tarps and even jackets – were used to plug up the previous, unsecured inlet pipe. In the most recent attack on the dam, the suspects used a hacksaw to cut the lock to a steel grate lid leading to the outlet control structure on the dam exposing the pipe that drains the reservoir. 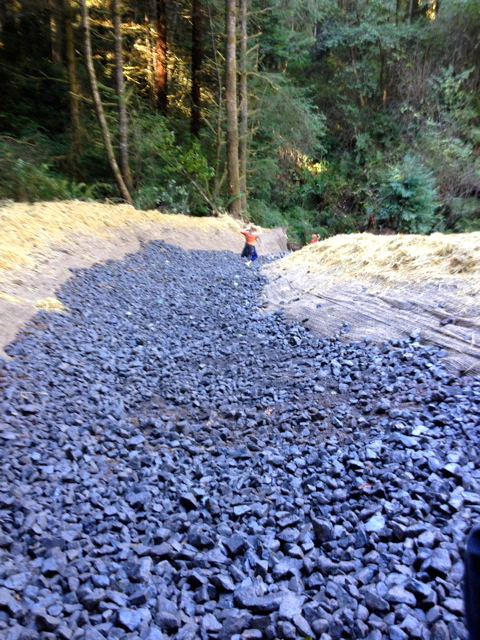 They then stuffed it with a variety of available materials – a large, jagged rock, loads of pea gravel and wadded-up pampas grass, reducing to a trickle water flow from Jolly Giant Reservoir into the creek. Compounding the maliciousness, the cut lock was then replaced on the inlet’s door to conceal the vandalism. The tactic worked – it wasn’t until water levels had risen above the top of the inlet that the vandalism was discovered. The culprits also rolled a large concrete pipe down a slope from where it had been staged for further work next year. “It takes more than one person, because they’re heavy,” said Environmental Services Director Mark Andre. The Arcata Public Works department was able to remove some of the debris, but the drain pipe remains partially plugged, restricting water flow. “It’s expensive, it’s a hassle and potentially very dangerous,” said Environmental Services Director Mark Andre. Environmental Services is closely monitoring the structure. In a worst-case scenario – that which the dam renovations are being implemented in order to avert, such as a 500-year flood – the restricted flow could cause the reservoir’s water level to rise and potentially compromise the dam. This summer and fall, the dam’s spillway was rocked and prepared for outflow, in case a 500-year storm hits. While the water level remains 40 feet or so below the crest of the dam, it may not take a full reservoir to cause the aged structure to fail. That’s why next year, a 36-inch pipe will be installed some 15 feet below the top of the dam. “This is a very unfortunate situation. Plugging the outlet pipe from the Jolly Giant Dam could result in a serious structure failure that would jeopardize life and property as well as natural resources located downstream,” Andre said. The cost of the damage is unknown at this time, but is expected to be significant. The City of Arcata is offering a reward of $500 to anyone with information leading to the arrest and conviction of the person(s) responsible for the vandalism to Jolly Giant Dam. Given that the effort took at least two people and a persistent effort to accomplish along the busy intersection of trails, the City is hoping that a witness will step forward with information. “We’re hoping somebody saw something up there,” Andre said. On Tuesday, Nov. 27, the water inlet was cleared thanks to a sustained effort by the City’s Public Works and Environmental Services workers. According to Andre, employee Gary Osborne climbed down into the hole, and with water pouring around him for 45 minutes or so, dug, pryed and pulled pipe clogging rock and organic vegetation until the plug was cleared. Additional Public Works staff assisted with pumps, shovels and hauling rock out of the hole with buckets and bins until the clog was removed. This entry was posted on Wednesday, November 28th, 2012 at 3:33 pm	and is filed under News, Environment. You can follow any responses to this entry through the RSS 2.0 feed.